"A_Kron," a community manager for Telus, posted a short schedule of upcoming software updates on this thread. 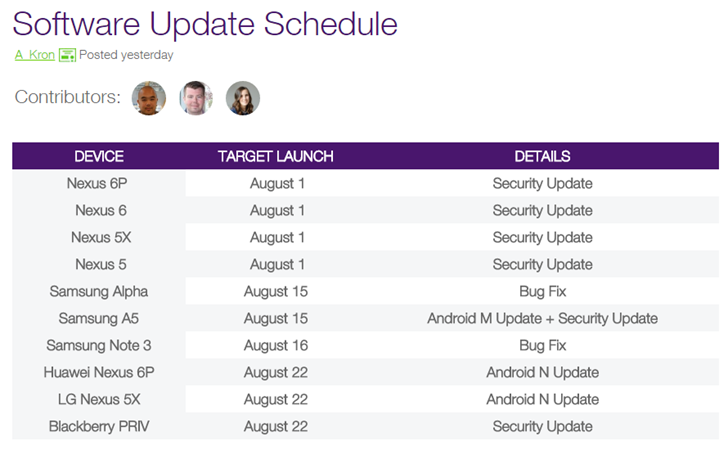 Among other, less interesting devices, August 22nd is listed as the scheduled date for the "Android N Update" for both the Nexus 5X and Nexus 6P. Normally we'd disregard this sort of thing, but Telus has a history of posting accurate timetables for software updates. With the increased Nexus leaks coming in the last few weeks, an imminent release seems possible. As Android fans will no doubt recall, updates for Nexus devices tend to accompany the final retail announcement for a new Android release, including the announcement (if not immediate availability) of new phones and tablets. Of course it's not over until the international technology corporation sings, but we'll certainly be keeping a weather eye out for any big announcements on Monday of next week.